Please let us know what personalized information you want on your custom tags. We can change the text and add information like: name, troop #, event, location, date, etc. For sale are a set of ten (10) IRELAND Celtic Cross Clover Shamrock Trefoil Scout SWAP or Craft Kits. There are so many opportunities to gift these colorful SWAPs. These kits are the perfect gift to give friends and family on St. Patrick's day (March 17). If they aren't wearing green, they will be thankful you saved them from lots of pinches! These SWAP kits can be used to teach and celebrate the geography, history, and culture of Ireland and its people. They make a great craft for a geography lesson, a celebration of Irish heritage, or a diversity event. 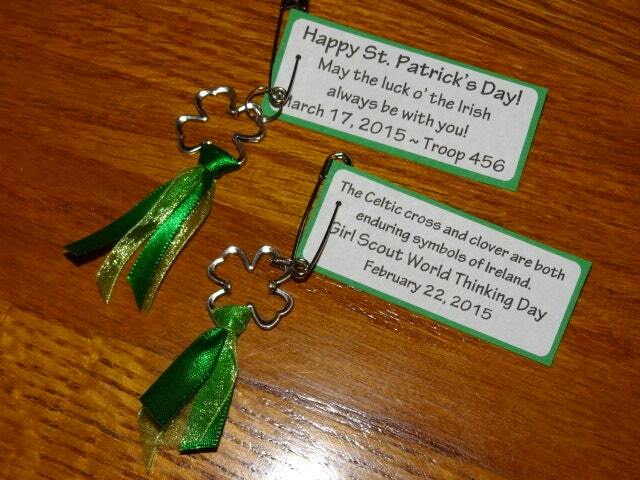 These kits are also perfect for celebrating World Thinking Day, recognized annually on February 22. Sponsored by the World Association of Girl Guides and Girl Scouts (WAGGGS), World Thinking Day celebrates the ten million guides and scouts from 146 countries around the world. Each SWAP kit includes a silver Celtic cross or clover charm that hangs from a split ring and safety pin. Two colors of green ribbon are tied to the charm. All of our SWAP and craft kits are individually packaged. JUST ADD SCISSORS! All Girl Scout SWAPs include FREE personalized tags. Send us a message with your desired text, and we'll take care of the rest!